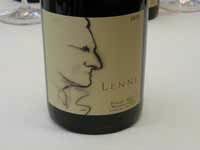 During my recent visit with Steve Lutz, the owner, manager and vineyardist behind Lenné Estate in the Yamhill- Carlton AVA, we tasted through the lineup of 2012 vintage Pinot Noirs side-by-side. Established in 2002, the Lenné Estate’s 20.9-acre vineyard is ideally situated among many famous neighboring estates such as WillaKenzie Estate, Shea Wine Cellars & Vineyard, Solena (recently acquired by Kendall-Jackson), and Saffron-Fields Vineyard. The vineyard is entirely Pinot Noir, planted to clones 115, Pommard, 114 and 777 in 2001, additional Pommard in 2003 and additional 114 and 777 in 2004. Soils are primarily Peavine with some Willakenzie. Elevation is 375-575 feet with primarily a south facing aspect. The 2012 vintage was characterized by small clusters and berries and little disease pressure allowing the fruit to be harvested very clean. Rounding up enough pickers at harvest was the biggest challenge. The 2012 wines required no special manipulation. After a 5-day cold soak, the must was inoculated, punched down a couple times a day, and pressed without any extended maceration. Steve is not a believer in extended barrel aging so the wines were kept in barrel for 11 months and then bottled unfiltered. The wines are vinified by winemaker David O’Reilly of Owen Roe fame. David recently broke up with his partner and no longer makes wine at the St. Paul winemaking facility the partners used for years. Steve is planning to build a custom crush facility on the Lenné Estate property where the wines of Lenné Estate can be produced side-by-side with O’Reilly’s Owen Roe wines along with wines of other producers. Last year an initial offering to raise money for the new facility brought in 50% of the needed funds. Investors received 4% to 5.5% on their loan and a Lenné wine component allocation. Inquire with Steve if you have interest in becoming a lender/investor. Steve is also currently expanding his tasting room to include a kitchen, making the hospitality facility more amendable to hosting events. All the 2012 wines tasted were elegant and eager to please with modest tannins and generous fruit-forward flavors. The 2012 Pinot Noirs were released May 31. The tasting room is open weekends from 12-5 and other times by appointment. You are also welcome to come in anytime the gate is open. Visit the website at www.leneestate.com. Interestingly, Steve held back 110 cases of the 2008 vintage and will release them in September 2014. These are highly complex wines that seem to be capable of aging forever. A special 2008 Pinot Noir consisting of a selection of some of the best barrels from the 2008 vintage is offered currently for $55. 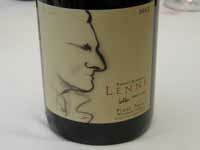 Labeled the Lenné Wetlands Conservancy Pinot Noir, nearly half of the proceeds from the sale of each bottle are donated to Wetlands Conservancy. Contact Steve directly to order: steve@leneestate.com.